In the Allies’ post-war analyses of the Nazis’ defeat, the “weakness and incompetence” of the German intelligence services figured prominently. And how could it have been otherwise, when they worked at the whim of a regime in the grip of “ignorant maniacs”? But what if, Robert Hutchinson asks, the worldviews of the intelligence services and the “ignorant maniacs” aligned more closely than these analyses—and subsequent studies—assumed? What if the reports of the German foreign intelligence services, rather than being dismissed by ideologues who “knew better,” instead served to reinforce the National Socialist worldview? Returning to these reports, examining the information on enemy nations that was gathered, processed, and presented to leaders in the Nazi state, Hutchinson’s study reveals the consequences of the politicization of German intelligence during the war—as well as the persistence of ingrained prejudices among the intelligence services’ Cold War successors. 1.What’s your elevator pitch for German Foreign Intelligence from Hitler’s War to the Cold War? How would you describe the book in two or three sentences? German Foreign Intelligence from Hitler’s War to the Cold War examines the reports prepared by the Nazi-era German foreign intelligence services and their Cold War successor organizations, and evaluates the politicization of the German foreign intelligence services in both periods. I argue that during the Second World War, the German intelligence services’ politicized intelligence reports on foreign affairs provided flawed evidence confirming the Nazi worldview that 1) Great Britain would “see reason” and exit the war quickly, 2) that the Soviet Union was a teetering colossus that would crumble in the face of the Nazi invasion, 3) that the United States, despite its enormous economic and military potential, would not decisively effect the outcome of the war in Europe, and, 4) that all three states were puppets in the hands of international Jewry. 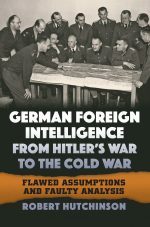 Moreover, I argue that when former German intelligence officers endeavored to leverage their “expertise” on the Soviet Union into positions of prominence in West German and American intelligence institutions after 1945, their reports continued to reproduce the flawed wartime tropes of innate Russian military and racial inferiority well into the 1960s. 2. What led you to research and write about the German foreign intelligence services? When I was just starting out in graduate school, I read Richard Breitman, Norman Goda, Timothy Naftali, and Robert Wolfe’s U.S. Intelligence and the Nazis, which did some fantastic work in the then-recently declassified files of the FBI, CIA, and other American government agencies, pertaining to what the U.S. government knew about the unfolding Holocaust, the role of German intelligence agencies in the Holocaust, and the connections forged between a number of former German intelligence officers and U.S. intelligence agencies during the Cold War. After reading U.S. Intelligence and the Nazis, I found myself wondering if the German foreign intelligence services’ role in the Holocaust was representative of a wider than expected ideological agreement with the Nazi worldview more generally. If so, what kinds of reports did these people write during the war? And if they continued working for the United States or other Western nations during the Cold War, apart from the moral aspects of that, in the absence of the Nazi dictatorship, did they continue to understand the world the same way? I was fortunate enough to do my graduate work at the University of Maryland, which is located in very close proximity to the National Archives in College Park, where the declassified American intelligence records are held (in addition to their captured German records collection, which also proved valuable in the early stages of this project at setting the scope of inquiry), and so I was off to the races. 3. According to Derek R. Mallett, your book demonstrates that Nazi ideology pervaded the German intelligence services and that their collective body of reports, rather than countering Hitler’s beliefs in fact supported and perpetuated them. Can you draw parallels between that time in German intelligence and any current regimes or agencies? My expertise on the present is quite limited, but I can make a general point in response to this (excellent) question. The mechanism for how this worked – how the German intelligence agencies failed – during this period is that, during the Second World War and Cold War, when information on their opponent (particularly the Soviet Union) was scarce, the intelligence officers writing the daily and weekly reports increasingly relied on prejudices and national character as modes of analysis to fill the gap in hard data. This was not controversial, as there were certain things about “the Russian” that these people, given their cultural milieu “knew” to be true. “The Russian” was primitive, hard, brutal, cruel, indifferent to suffering, etc., and, as a result, the German intelligence services argued during the war and after that these innate characteristics defined Soviet political and military strategy, even down to the operational and tactical levels (“the Russian” preferred the defensive to the offensive, was not capable of operational brilliance or innovation and so on). So, why do I bring this up in reference to this question? There is some evidence that similar processes take place in foreign intelligence analysis today, where national and cultural stereotypes about some enemies can lead to broad, incorrect conclusions about the motivations or tactical and operational capabilities of jihadist insurgents, for example. Some of the language of the Cold War, to which my work is more directly linked, is rooted in these types of tropes and continues to be employed both in intelligence analysis and at the policymaking level – one aspect of the current debate about the proper American response to Putin is an all too familiar debate about whether force is the only language that “the Russian” leadership understands. 4. Your work reveals the consequences of the politicization of German intelligence during World War II—as well as the persistence of ingrained prejudices among the intelligence services’ Cold War successors. What steps can be taken (or have been taken) to de-politicize national intelligence in modern governments? That’s a great question with a highly complex answer. Generally speaking, the modern understanding of the purpose and function of foreign intelligence services is to gather and contextualize information for policymakers. In the case of the United States and many other Western countries, while the head of the foreign intelligence services may be a political appointee there is a general assumption (in theory) that an ideologue or political party loyalist would be an inappropriate selection to head such a service. This reflects the view, particularly given the American historical context with J. Edgar Hoover and the FBI, that intelligence services are politicized form the top down. In this regard, most of the public concern, to the extent that there is public concern on the matter of politicization, is limited to the leadership of these institutions. What I found striking about the German intelligence agencies I examined, is that he reports produced by these agencies indicated that “politicization” was not a matter of intelligence chiefs shaping reports to their personal preferences or the preferences of policymakers, but rather that the reports and analysis of mid-level career intelligence officers were themselves politicized. In some cases, these individuals’ careers long-predated the Nazi dictatorship or survived long after it was over. As a result, the politicization that is most important for my work is the politicization of cultural consensus and unquestioned, widely-held preconceptions of the world (anti-communist, anti-Russian, etc. ), by analysts themselves. So I think more attention could certainly be paid to that – leadership is not always the deciding factor in whether or not an intelligence service is effective in objectively gathering and contextualizing information. This calls for rigorous self-examination. What are our internalized stereotypes, prejudices, and assumptions about the world and how does that subtly influence how we interpret world events? 5. What is one thing you would like readers to take from your work? It may sound overly simplistic, but power of ideas and beliefs. The subjects I study were not stupid people. Many of them had country-specific university degrees, international language skills, and, in some cases, decades of experience in the countries they covered. Their prejudices and assumptions about how the world worked, however, undercut that, leading to, frankly, ridiculous interpretations of world events. The power of ideas led to one German Foreign Office representative who had lived and worked in the United States for decades to argue that the United States did not possess (either in peacetime or ona war footing) the economic or manpower resources to prosecute a war simultaneously in Europe and the Pacific and so the United States could be entirely discounted from a military planning perspective. There were German intelligence officers who really believed that Churchill was a captive of Jewish capital and that it was only a matter of time before the British people realized this betrayal and turned on his government. The power of ideas trumped the power of data, because no matter how adept the German intelligence services were at obtaining economic or military data during the war, the ideas and beliefs made a compelling case about why the data did not matter. 6. If you could have any one person read your book, who would it be and why? I cannot think of any one person, but I think aspects of my work would lend some potentially valuable perspective to PME (professional military education), especially the portions that touch on unconscious biases. Moreover, the lesson of the Cold War era collaboration between the ex-Nazi intelligence officers and American and West German intelligence institutions illustrates the great care that must be taken in trusting and learning lessons even from Allies. Like their American counterparts, these officers were sincerely concerned about Soviet aggression, and, as the last military to engage the Soviet Union militarily, it was not unreasonable for the United States or other Western countries to seek out their experiences. Setting aside the moral implications of that decision (turning a blind eye to war criminals or allowing war criminals to be rehabilitated), the fundamental mistake was not seeking allies in the Cold War, but a flawed assumption that the German experts on the Soviet Union were experts at all. In strategic thinking, this is called “mirroring”: American intelligence professionals assumed that German intelligence officers were equally professional and non-political, and shared a practical worldview separate from that of the dictatorship from where they came. So a healthy skepticism about the value of the expertise the Americans were getting from their new allies was not always present. This definitely has implications for any sort of multi-coalitional undertaking in contemporary affairs – where misinformation or disinformation can be amplified due to a lack of contextualization or skepticism.